Luxury hotels are situated just a block away from terraced houses rented out for under two hundred dollars a month and many apartments go for even less than this. Walking about the city is by far the best way to get to know how people work and live and survive and you do feel less of an intruder this way. I cycled to Shkodra from Durres and stayed in a spartan fifteen Euro-a-night central hotel one torrid July weekend before cycling on along the notorious Prizren Mountain Road on my way to Kosovo. Putting away the bike for a couple of days and walking the streets enabled me to relax and recover from the scourging mid-July heatwave raging across all of Albania. And I had a few hours on hand to experiment with my Leica M-E fitted out with a 35 mm Carl Zeiss Biogon T f2 lens. So do enlarge all of the colour images in this post to see the detail and tones that the Leica and Zeiss lens are capable of capturing together. 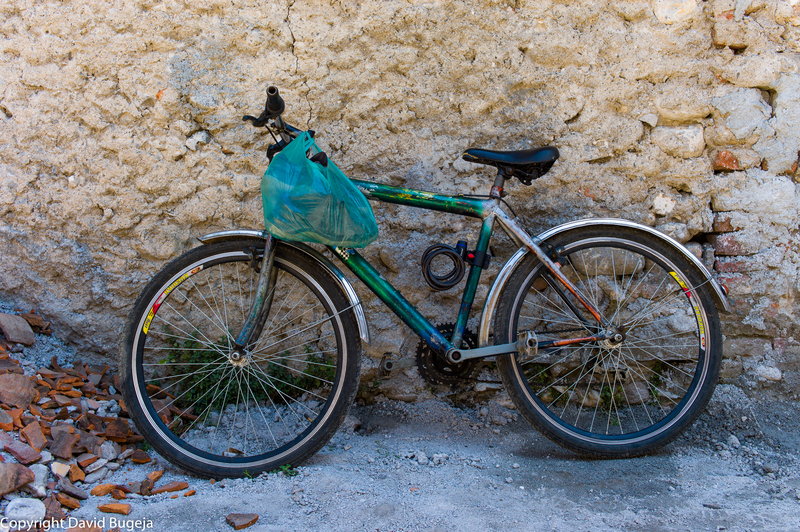 Travelling solo by bike and I simply couldn’t resist taking a picture of this local bike hidden deep inside the warren of winding, narrow streets of Shkodra’s old town. Do check out the detail in the bike’s paintwork at maximum enlargement! This crumbling palazzo is located right in the city centre on a cobbled boulevard opposite a sprawling lush green park where old men play dominoes and chess, squatting in the grass or sitting on upturned wooden crates. 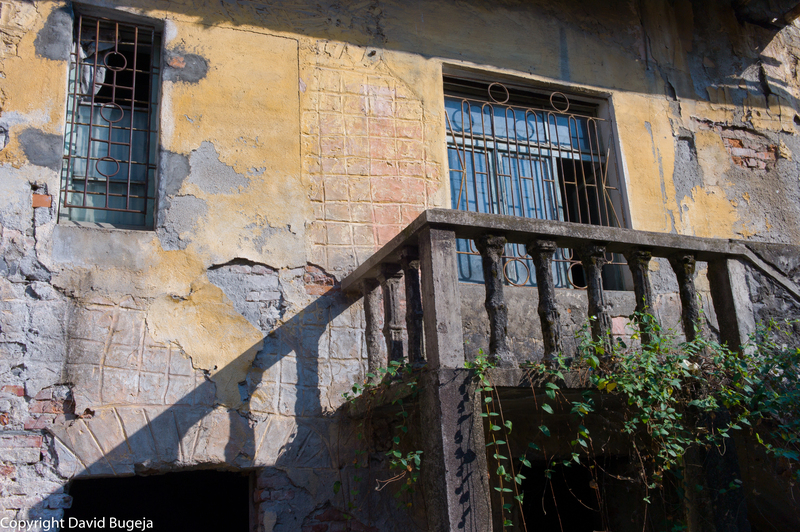 I was fascinated by the play of golden evening sunlight reflected off stone and plaster beneath the open balconies of this derelict building. And what about the interior detail of the crumbling, corroded iron mesh holding up the roof from caving in and visible through the wide ajar door right above the balustraded balcony? Not much time to compose the picture – a troupe of half-naked Roma kids noticed me and rushed up, milling all around me, crying out for cash. I felt very privileged to be visiting this place and take pictures at my leisure when these kids had nothing at all. Not even clean clothes. No shoes or sandals either. Calloused and grimy bare feet. Running around all day on tarmac, pavement and cobbles. I quickly zipped the camera out of harm’s way, gave them some leke for their dinner and they were off again, banging their drums down the old city central boulevard where a chic, yuppy clientele hang around on sultry summer nights for a gelato italiano, a cappucino, liquors, full course gourmet meals of grilled meat and vegetables and salad contornes. For a long time I used to think there must be glamour and excitement in quitting a job and setting off to explore the world and indeed I did this once and stayed out for a year travelling across Eastern Europe, the Middle East and India. But when the cash starts to run dry, when the months really start rolling by you start asking yourself plenty of questions. But the main question always is should I keep on doing this all of the time and what about when the money runs out? Romas and gypsies are amazing people and keep on surviving on the fringes of society on their own terms no matter how hard their circumstances seem to get. They seem to me to be so convinced in the manner they want to live, that nothing could ever detract from their will of persisting as they’ve always done even when faced all of the time with extreme penury. That’s admirable! (i) make a job of exploring the world and do your best to work as you go along. There’s no shame in any job you pick up along the way so long as it’s honest and is of help to society, even though you would never have accepted such a ‘degradation’ back home! Degradation is a negative word. Think of it rather as alternative downshifting necessary to realize your dream. (ii) learn from the gypsies and be willing to endure much hardship to be able to go on further and further, day by day. Remember the harder it gets the more worthwhile it’s having! I should have stayed in this hostel and avoided the hot and stuffy and poorly run Hotel Ideal close by in the city centre. I got to this place with a friend I met along the way – a 32 year old German cyclist who had quit his job months before and cycled off from Berlin to Athens by way of Albania. Nine years do make a difference on the bike! There was no way I could keep up the pace with this guy who was also carrying around more weighty stuff on the bike than I was. He opted for the hostel. “Nice to socialise with people” he said, in spite of the limited showering facilities for people choosing to camp in the garden outside the dorm – just one shower in this heat felt far too stingy for my liking. I needed the space and the comfort of a single room and checked into the Hotel Ideal close by – I certainly don’t recommend it! Decent hotels in Shkodra start at Euro 30 a night. Don’t even bother to look at anything going for less. It’s either a decent hotel or this lovely hostel if you can take its spartan routine. The ambience is just so relaxed and laid back. Families and kids live here. The kids were so curious when I pointed my camera at the building. The incredulous looks on their faces seemed to ask what on earth is there worth taking a picture of? But this place has character. Kids run up and down those stairs several times a day. They run down to school and up again when they’re back home with parents and grandparents to enjoy an afternoon altogether. Everyone seems to know just about everyone else and you do feel at home to be here with such soulful and helpful people. 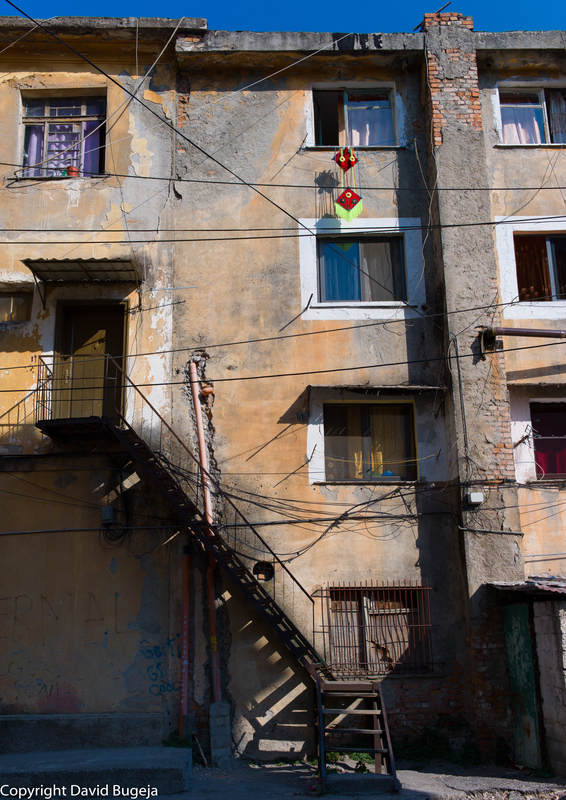 Soul, helpfulness, consideration of the needs of others are rarely the marks and virtues of the filthy rich who tend to ride roughshod over people in need, not just here in Albania, but the world over. But get onto the streets, get to where working class and lower middle class families live and stick around these neighbourhoods for a while and long enough to start knowing these people and you shan’t be disappointed by the richness of your experience. I never cease wondering about those people who once lived in these abandoned houses. How did they live? What happened to them? Were they forced to leave? How long ago had they left? Would they ever come back?And what about the houses? What would happen to these houses now that there was no one else to take care of them? Abandoned houses with their boarded up windows and crumbling paintwork and weed overgrown gardens and pitch dark basement cellars, with torn out iron grilles and chock-a-block with garbage, sadden me when I walk by. Many times I do take a picture. 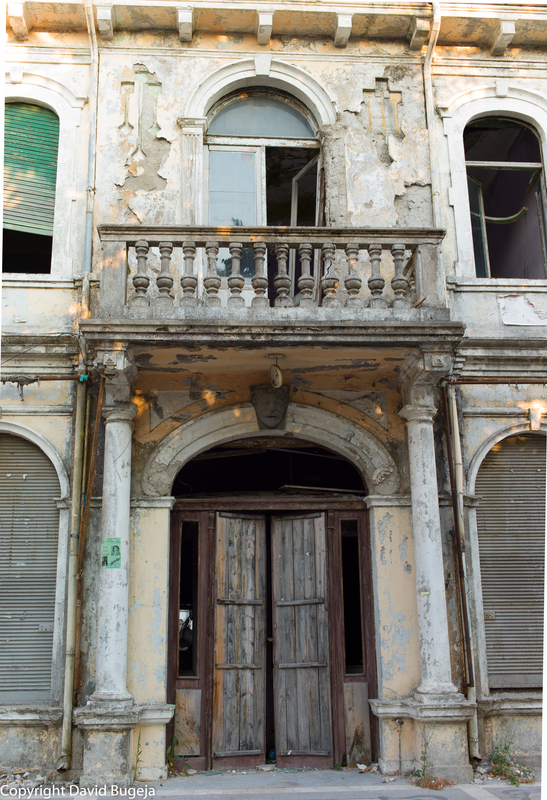 And each time I come this close to consider buying a property all for myself I look at these pictures of of all those abandoned houses out there in Shkodra, Durres, Gjirokastra … And I ask myself how could it ever make any sense for a footloose soul to ever weigh anchor and invest in real estate? No matter how tempting and tantalizing the comforts of setting down roots can get, these pictures just throw all that straight out the window! My bike and whatever else I can carry along are all I need to have enough and not feel deprived. 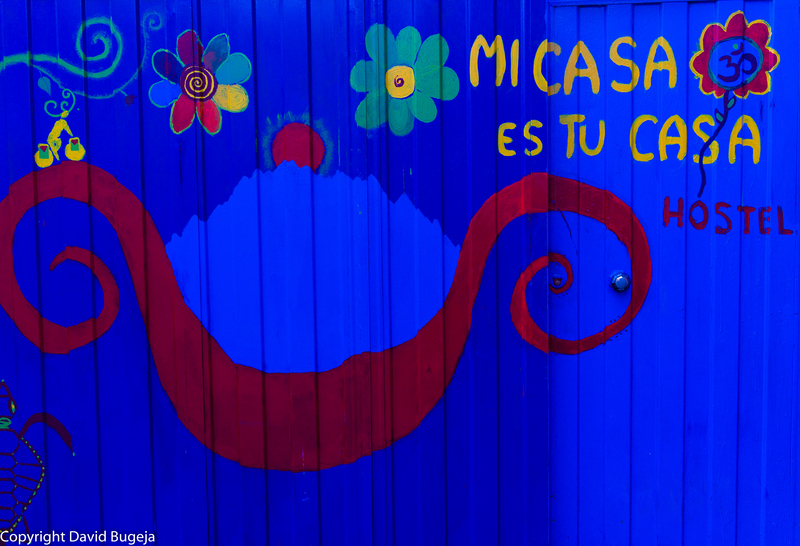 I took this final picture half way down a narrow alley in the old town. Around noon and too hot to move but I wanted to use up my time as best as I could and stay away for as long as possible from the barely functional hotel I was staying at and my furnace garret bedroom on the top floor. Brilliant blue sky obstructed by a tangle of intertwining wires and held in place by supporting iron poles. That’s what property does to you even on such a fine summer day, nailing you down in one place and always calling you back! And if I had my own property and was tied down to it, I probably would never have had the time and opportunity to wander about these little streets of Shkodra and discover how someone else had chosen to live differently and taken the plunge and erected this house and the wire cobweb and so forever keeping everything else out of his life.